Recently I found out I got an account on a website called Scribd. Well I never heard about this website before, yet it had an public profile with my full name and picture. Apparently people from my Facebook friends list also have accounts, and "they" followed me and "I" followed them. At first I was shocked. "I never registered for this site! ", "How did they get such personal information? ", "Why did it took actions in my name like following other people?!". At first I thought some idiot friend used an app that stole my information, but it wasn't the case. I looked into my Facebook privacy settings, and after a short while messing around I found out about "Instant Personalization", or in less misleading words, "We sell your personal information to other sites!". "When you first arrive at the following sites, you'll see a notification message and an option to turn off the personalized experience"
But when I entered Scribd, I wasn't given an option to turn it off, in fact the profile with my personal information existed there long before I've ever entered the site. It seems that Facebook doesn't ask for your permission before enabling Instant Personalization, but it's possible to disable it. 2. Go to "Ads, Apps, and Websites". 3. Go to "Instant Personalization". 4. 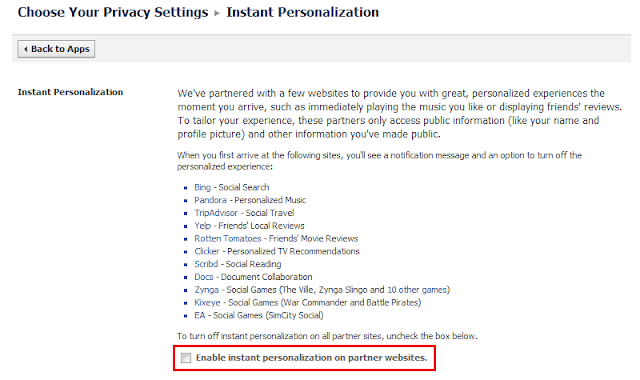 Uncheck the check box that says "Enable instant personalization on partner websites.". I'm afraid of their next step, what will it be? Publishing more personal information like birth dates, addresses, and phone numbers, without permission?